I am a Ph.D. of Philosophy student at the University of Lagos, Nigeria. I am the winner of a partial scholarship, which gave me the possibility to attend this unique and very interesting program organized by GBI. Friday, June, 23 was our first day of field trips at the International Bioethics Summer School. First we visited the United Nations Headquarters, and then the Memorial Sloan Kettering Cancer Center. Initially, I thought that the field trips would be mere social outings and sightseeing with photography opportunities. The trips proved to be far more than that, functioning as educational trips loaded with significance. 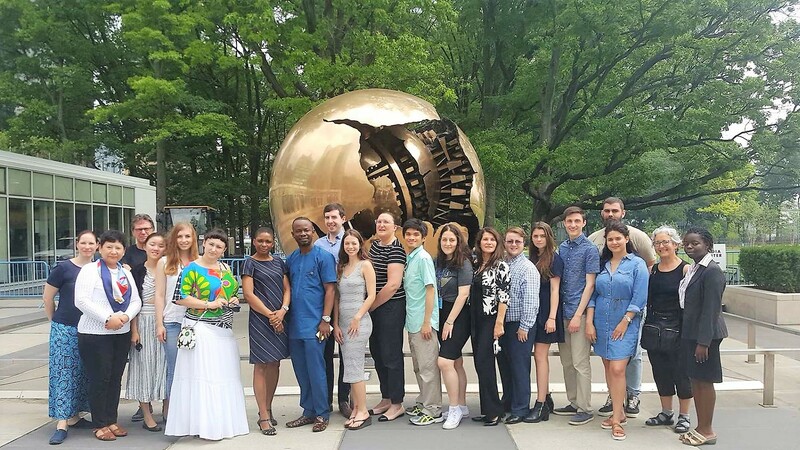 As I got to the main entrance of the UN Headquarters, the UN’s commitment to international peace and security came to mind, which I had learned while obtaining my Master’s of International Law and Diplomacy at the University of Lagos, Nigeria. One of my colleagues called me across the road to take a picture, and a building’s inscription from Isaiah caught my eye: “They shall beat their swords into plough-shares and their spears into pruning hooks; nation shall no longer lift up sword against nation. Neither shall they learn war anymore.” At this point, though the world is still ravaged by wars, terrorism, and insecurity, I was reminded of the UN’s divine mandate. As I walked into the compound after the security check, I spotted the statue of a gun and its tied barrel signalling no more wars. At this moment, I remembered the Pact of Paris, an international treaty from 1928 that calls for the renunciation of war to serve as national policy. Despite having predated the UN, the agreement was incorporated into the UN Charter. Our lecture at the UN Police Division (UNPOL) with Mr. Steffan Keller on the challenges of international policing with regards to human trafficking raised many critical issues, and was accompanied by an enriching discussion. As I realized about 70% of UN Police is in Africa, I wept for my continent, which still suffers from underdevelopment, poor leadership, war, disease, famine and other challenges despite its enormous resources. In all, it was a truly enlightening lecture with active contributions from the GBI students. However, I left the lecture room bothered by how frequently we observe national governments’ flagrant violation of human rights, and the acute failure of such governments to fulfill their primary responsibility of protecting lives and property. Despite having the supranational role of universal human rights protection, the UN is sometimes either slow to act, or experiences encumbrances in intervention because of the Doctrine of Non-Interference. On our trip to the Memorial Sloan Kettering Cancer Center, we learned about the recent breakthroughs in tackling cancer and heard from Dr. Isabelle Riviere, Director of the Cell Therapy and Cell Engineering Facility. She and her colleagues gave a thrilling presentation, which included a slide captioned, “More science, less fear.” It prompted me to think that science involves humanism and allows for better life, though it also implies, “more scientific developments, more bioethical issues.” Essentially, any responsibly practiced scientific field ought to be prepared to grapple with the ethical issues created by its breakthroughs. Indeed, bioethics is a discipline for all of us. Through its unique summer program, GBI is truly committed to doing bioethics in real life!